Campus at the end of the roof to the right of Embellie Pulmonaire. Dans le descriptif il y a écrit sans les pieds, et sur les photos et la video les gens posent leurs pieds ou crochetent talon. Il est ou le bug? Quand je regarde la photo d'Olivier Lebreton, qui a ouvert ce bloc, j'ai l'impression qu'il n'y a qu'un pad et qu'il ne pose pas ses pieds sur le caillou. Quand je regarde par exemple la photo de Nicolas Altmaier, je vois une triple epaisseur de pads et deux pieds posés sur le bloc. jcomprends po... zont pas lu la description? Effectivement, quand tu vois la tof d'oliv, je vois pas 4 pads empilés...En plus quand tu connais un peu le lascar, il a coté 7c+ tu comprends un peu le problème ! 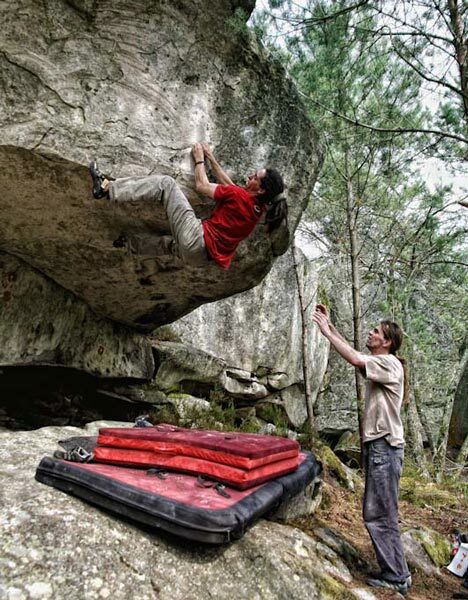 Maintenant que le premier croiteur acharné avec ses 5 pads qui a fait sale gosse de la même manière mette son avis à 7b, là c'est limite, un peu d'éthique merde !!!! 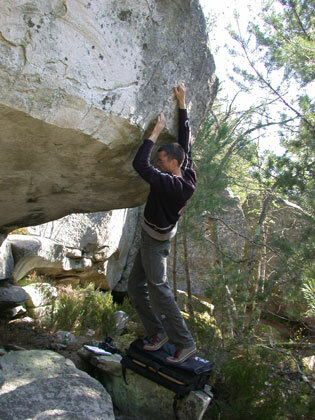 When you start on the second crimp wich Bart is feeling on with his right hand in the picture then the problem is probably not 7c+,but when you start on the lowest crimp with the right hand and then fall in the second crimp with left hand (wich Bart is taking on the picture)and then direct to the top the problem is definetly 7c+ in my opinion. Conclusion:everything depends where you start . 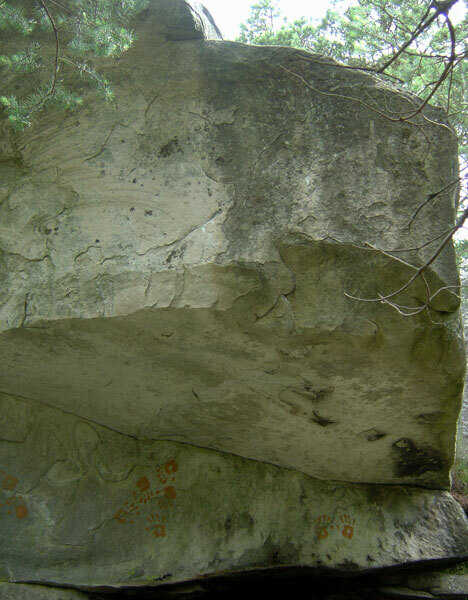 Did you do it with the heel hook, or campus? with heelhook and start on the lowest crimps. If I remember it well, Dennis and I started from one crashpad and made two campus moves (no heelhook) before dynoing to the top. That's one move more than Stanley does in the video on Youtube and Steelfingers. We believe the correct grade for this extraordinary problem is 7c. But grading will always be a personal thing. Start from the ground (double pads are cheating anyway) and take the holds you're able to reach. I can't say much about other methods than I used but skipping a move on a three move problem might change something. For me, the second move is the hardest (first move if you start from multiple pads). Like skipping the first move on Sale gosse. 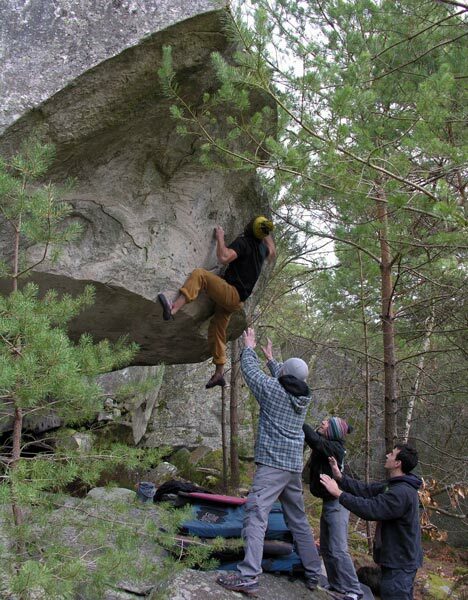 7c from the mono, 7b+ from the bidoigt. I agree there gugusse. so many people that the 7c on sale gosse by stacking the pads and reaching the bidoigt. and if I remember it well. Bart and I started with the right hand on the poor grimp which Bart is touching here with his left hand (http://bleau.info/raymond/1134.html) and with the left hand on the hold which I think you call the long grimp. Then we campussed with the right hand to the grimp which Bart is touching with his right hand, left hand to a grimp at the left and finally to the top with the right hand. We did not use a heel hook. Simply because I forgot to think beyond my nose. Faut pas exagerer quand même. Poser les pieds, c'est l'essence-même de l'escalade, les crochtages aux niveaux des oreilles y compris. De l'interdire serait une sacrée (et vilaine) convention. (Carnage et Big Boss se font no-foot aussi, mais chacun son choix.) Par contre, un départ s'effectue du sol, ou à la limite d'un (seul) pad. Do you start with both hands on the long crimp, because thats the only one i can reach from the ground. The only way to get the right hand side crimp (lowest crimp) is from a stone or double pad. I'm 1.78m so i wouldn't call myself a midget.